For much of Florida's history, the transfer of power from one Chief Justice to the next was an event shrouded in secrecy. No records exist from the early years of the Court, which first convened in January 1846 under the leadership of Chief Justice Thomas Douglas. One thing is certain: Whatever ceremonies occurred in earlier times were not open to the public. So it remained until 1996 when Gerald Kogan was elected Chief Justice by his colleagues. A centerpiece of his administration was a new program, called the Access Initiative, designed to make the Florida Supreme Court far more open to the public than it had been in the past. In fact, the continuous broadcast of all oral arguments by cable, satellite, and the Internet began during Chief Justice Kogan's term. In order to emphasize his commitment to openness, Kogan ordered that his inauguration as Chief Justice would be during a formal televised courtroom ceremony open to the public. 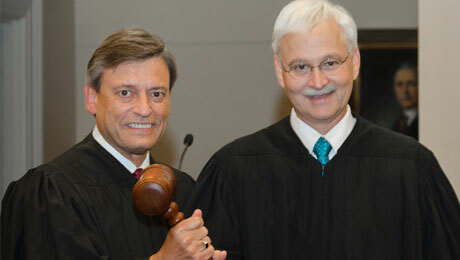 Thus the tradition was begun that continues to the present day with the Passing of the Gavel to Justice Jorge Labarga. Of special note is the Ceremonial Gavel used during today's ceremony. The use of a gavel during court proceedings is an ancient custom that dates to the time in English history when hammers or mallets were weapons of war. In this sense, the gavel symbolizes the authority of the Court over all who come before it. Its primary use has been to call proceedings to order, maintain decorum, and signify that a decision pronounced by the Court is final. The Florida Supreme Court's gavel is only used during the ceremony of transition at which a new Chief Justice is installed. On one side of this gavel is carved the Great Seal of the State of Florida, and on the other is the Great Seal of the Supreme Court of Florida, depicting a blindfolded Goddess of Justice holding scales in her hands. 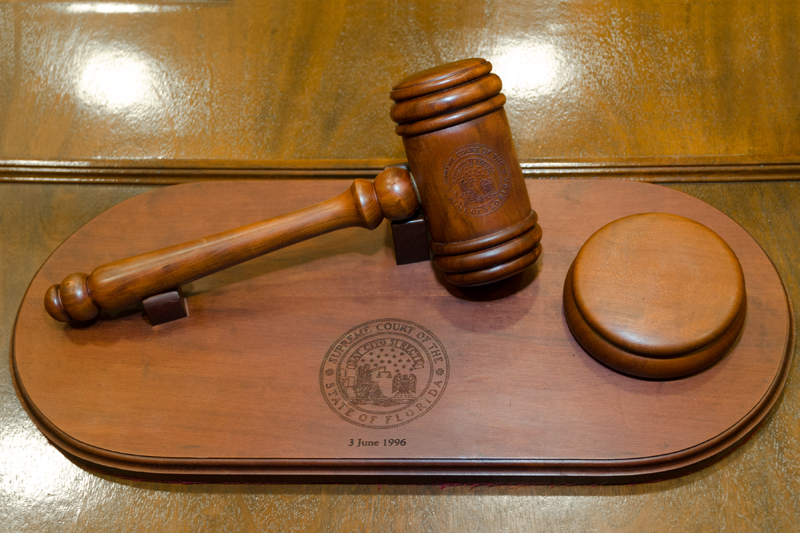 The gavel, a gift from the Florida Supreme Court Historical Society, was crafted of Florida cherry wood taken from a tree growing near the banks of the Suwannee River.